Still single at 39, Kayte Wexford has everything but Mr. Right. With keyboard at the ready, she turns to technology for help. Kayte dives fingers first into a sea of online dating, instant messaging and email exchanges where she connects with some charming, hilarious, bizarre and downright frightening characters. Each encounter teaches her something and tests her optimism, intuition and commitment, while advancing her that next necessary step in her quest for love. With so many fish in this cyber-sea, Kayte must decide which ones to toss back, which to reel in and which, if any, should be proudly mounted. Thankfully she doesn’t have to make the journey alone. Her dog Dylan is not only a good listener but a great judge of character, her best friend Chloe is Kayte’s consummate cheerleader, while her friend and cyber coach Roman provides dating tips and hints as he schools Kayte in the lessons required for online dating success. 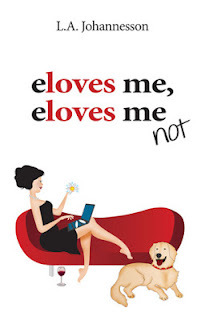 e loves me e loves me not started off philosophizing about wanting to find love. Something most women can identify with. I know I have put myself in many a questionable circumstance or gone on a date just with the hopes of finding exactly that. The book started off strongly discussing the different ways that women search for love, from singles events, to blind dates to anything and everything in between. This story focuses on online dating which is definitely a very timely and popular way to meet people and something I have personally tried (and mostly failed at) so I found it entertaining to relive my past experiences through the main characters, which ended up being quite similar in a lot of ways. It was refreshing to see how Kathleen gets so wrapped up in the online dating world and how her experiences were in line with a lot I experienced. The descriptions of the dates and relationships that she made along the way were so bang on that I am pretty sure the author herself has had some first hand experience as well. e loves me e loves me not also appealed a lot as it was a sort of coming of age or rediscovering oneself type of story that was well developed and very down to earth. Life can definitely throw us some curve balls but Kathleen handled things with aplomb and was inspiring in her drive to keep things positive. However, at some times the story became a little bit too graphically sexual for what I like to read and I don't think it was necessary for the story and I even feel that it might have taken away from the overall strength of the story. Thank you to L.A. Johannesson for our review copy. All opinions are our own. Thanks so much for the review - appreciate your comments and am really grateful for the opportunity to share my story with you.